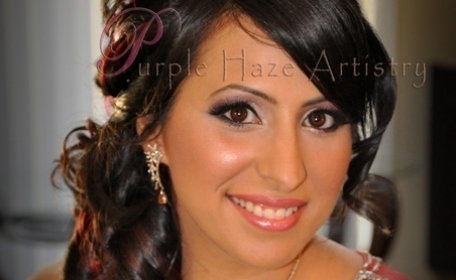 Purple Haze Artistry was by far the Perfect choice from beginning to end. 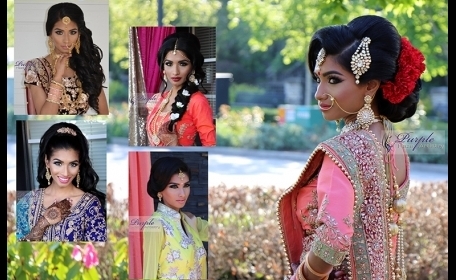 We had a total of 5 different looks which they absolutely nailed each and every time. 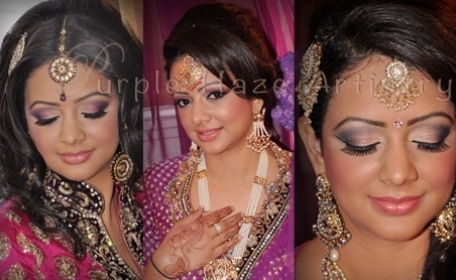 I immediately loved Gurv’s signature look & luminous style of makeup. 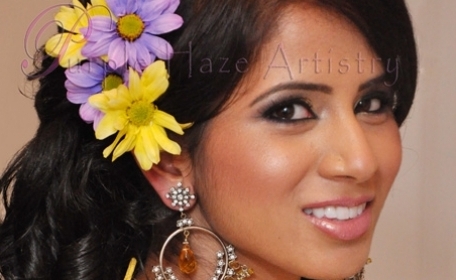 She was professional, responsive, made great suggestions and was so easy to work with. 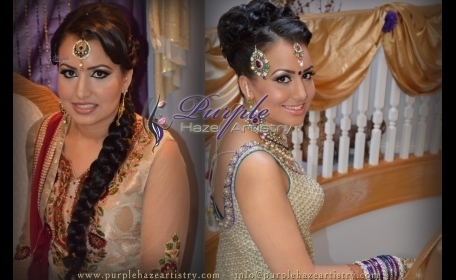 Sukhi did a glamorous job on my hair, I could not be happier with her marvelous creations! Gurv was the brains behind creating 5 spectacular looks that I am constantly getting compliments on. She went over and above her responsibilities as a makeup artist to make sure I not only looked the best I possible could but helped me make sure I was ready for each event. I cannot tell you how grateful I am for her, I honestly would have been lost without her guidance on my wedding day. 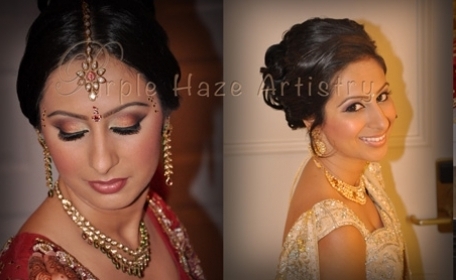 She is one in a million in the makeup world and every bride should be so lucky as to book her for their special day. 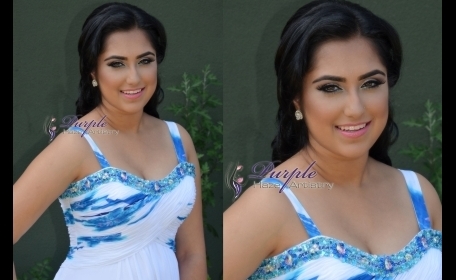 I looked like the best version of myself and the makeup lasted the entire day and night without needing any touch ups. Thank you a million times and I cannot wait to work with you in the future. 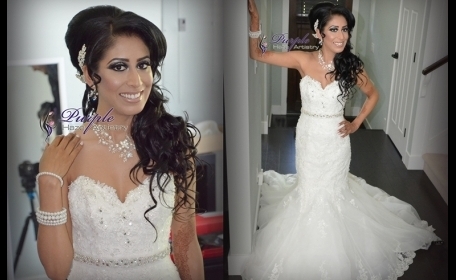 Thank you so much for making my vision of what I would look like as a bride come to life! I knew when you both did my engagement 2 years ago that you would be doing my wedding looks. I still receive so many compliments. Gurv, even though your wedding was the day after mine, you made me feel so at ease. You ladies truly have magic in your hands ❤ once again thank you, your the best! Thank you, thank you, thank you!! I know I looked like a beautiful princess on my special day!! You are great at what you do, the passion just shines through. Thank you for doing an amazing job on getting me ready for my wedding and reception! 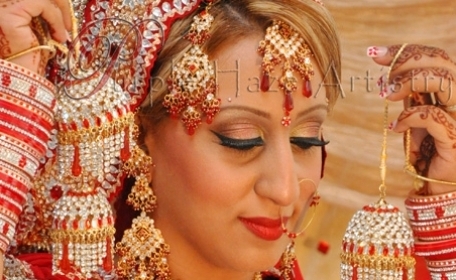 I can say you did a great job because I felt beautiful and received endless compliments. Gurv, from the very first time I booked you, I felt like you became a friend because you were so responsive and welcoming to every email, phone call, and idea. I love how punctual, professional and personable you girls are. Thank you again for going the extra mile to get me coffee on the morning of the wedding and the orchids I wanted for the reception since I had forgotten to pick them up in all that was going on. It made my day to see your compliment of our wedding being one of the most extravagant you have seen, it all just seems like it was a dream now! It was the best week of my life and I am so glad I had you on board to doll me up and help me feel at ease and ready for my big day. I hope you girls have a fabulous 2014 and keep up the great work! Thanks so much for everything! You girls were all so great to work with! I really appreciated your attention to detail with my hair and makeup - I can tell that you are all perfectionists and that you're not satisfied with something that is just "good enough." I got so many compliments both days and the looks you created were better than what I had envisioned. I will definitely be recommending you and your team to others. "Hey Gurv. Just wanted to say that you and rikki did an awesome freaking job. I got so many compliments especially on my makeup! And even by the end of the night it still looked like it had just been done! Thank you so much, you guys are great! 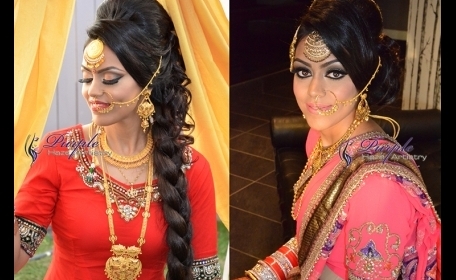 Thanks Gurv and Sukhi for putting my dream look to reality. I really liked the way you guys got me ready for my wedding. Everybody in my family here and in India likes my pics. 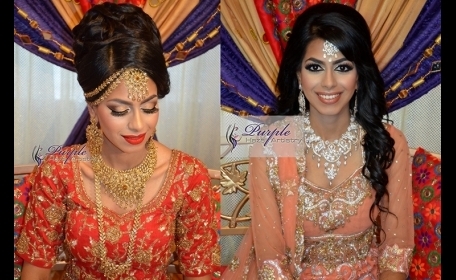 the girls & I would like to thank sukhi & jesse for their amazing work! they were super sweet & did exactly what we asked for, after everything was finished they made sure we were comfortable with our look. They were very professional & you guys helped us make our grad a night to remember! I would definitely be contacting her in the future:)! 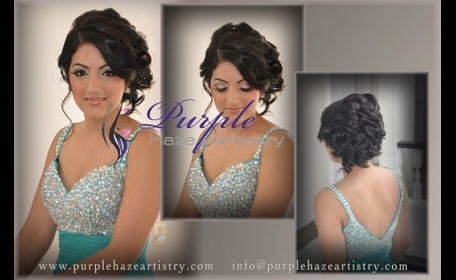 Thank you Purple Haze Angels for making me feel like a queen on my wedding day. You girls did an amazing job and i had so many compliments. Love you girls!!! I just want to say a big THANK YOU. First of all, you are a such a wonderful person, so down to earth. 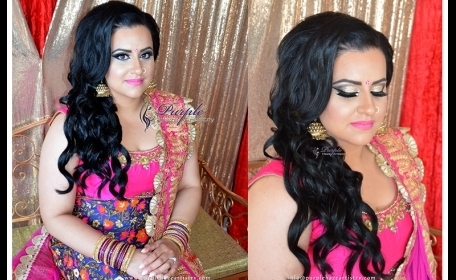 Sukhi did my hair and makeup and I must say she is a phenomenal artist. 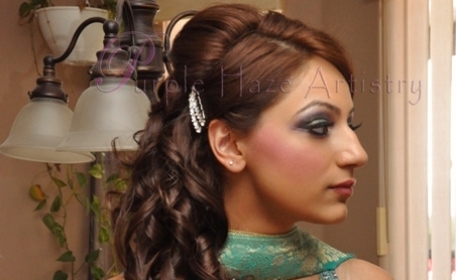 I loved the way she did my hair and makeup and I received so many compliments. She truly exceeded my expectation. I just wanted to take the time to thank you guys for doing an absolutely amazing job on my hair and make-up for my brother in law's wedding reception. Your senior artist was so nice to work with, she really listened to what I wanted and made sure I was 1000% happy with the end result! I received so many compliments that evening. I am looking forward to working with you guys again next year in March and will definitely be keeping you guys in mind for all future events! I wanted to take this chance to thank you ladies very much for doing a fantastic job on my hair and makeup for my wedding and reception. I received so many compliments on my hair and makeup, it was amazing. I was very pleased with the way it turned out and it lasted all day!! I still can't get over how I looked and it's because of the fabulous work you ladies did!! Thank you again for the outstanding service you both provided. 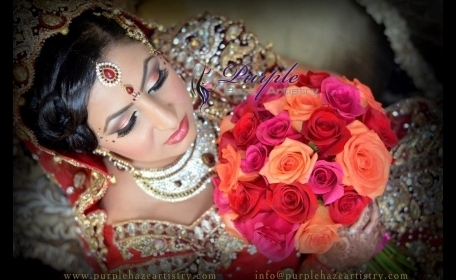 I would recommend Purple Haze Artistry to future brides, you are very organized, professional but most importantly caring and down to earth. I will definitely be calling you again for future events. I just wanted to send you a BIG THANK YOU! for being with me on my wedding morning and reception night, you ladies did an amazing job, I would not of wanted anyone else, you ladies sure know what you are doing, Very professional but so calm, mellow and relaxed at the same time. I felt so comfortable, calm and ready to get married!!! hahah i had No worries, no stress and no fears. You ladies are wonderful and i hope you keep doing what your doing for everrrr!!!! I cant wait to pass your name on to future brides, Keep your heads up high and keep doing what your doing, thank you again, love you lots! I know this is long over due but I wanted to say a big thank you to the both of you for the phenomenal hair and makeup you did for my wedding and reception. From our first meeting to the day of my wedding you two were nothing but professional and passionate about your work. It was a pleasure meeting you both and your laid back nature made me feel extremely comfortable. Not only did I receive endless compliments throughout the entire day but my make up and hair remained flawless as well. Gurv, This thanks is long overdue! I want to thank both of you for the wonderful job you did for my wedding and reception! I received so many compliments from my family and friends and felt simply amazing. Though it’s only been six weeks since the big day, it is that feeling I remember when I reminisce. It was infectious and really set the tone for the day. You are both so talented and creative…and fun! Your level of professionalism and skill, paired with your ability to execute what you envision, makes you both a pleasure to work with. thank you so much for doing my hair and make up for prom, you truly did an incredible job and I could not have picked better artists for my special day. 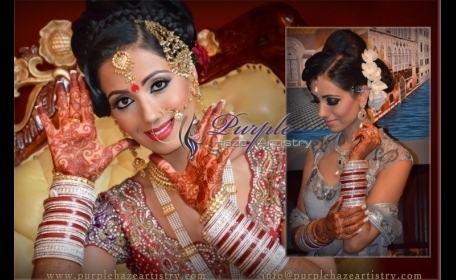 Along with being professional you and Gurv have wonderful personalities and kept Gagan and I very entertained. I will never forget my experience with you two and all of the crazy indian poses haha! Thank you once again! 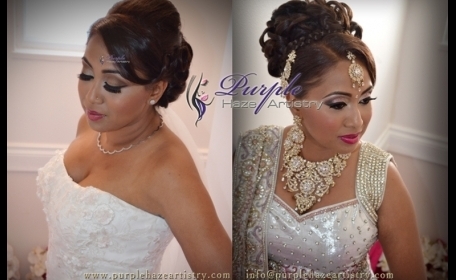 Gurv and Sukhi, Once again thank you so much for the hair and makeup. I loved it and it lasted me all day. Truly appreciate you guys doing such a great job. Thank you, truly amazing at what u guys do!!! Several months before my wedding, my sisters and I met up with Gurv. 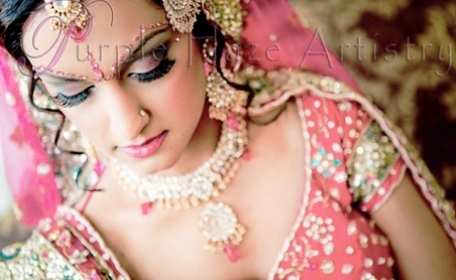 Upon meeting her, I knew that she was someone I would feel comfortable with on my wedding day. She was extremely friendly and professional. I wasn’t sure about the looks I wanted but I was comfortable enough to let Gurv decide. 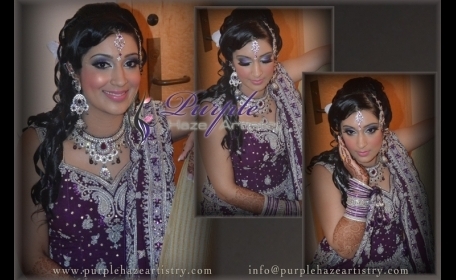 Purple Haze Artistry did a fantastic job with both my wedding and reception hair and make-up and each look complimented my outfits. 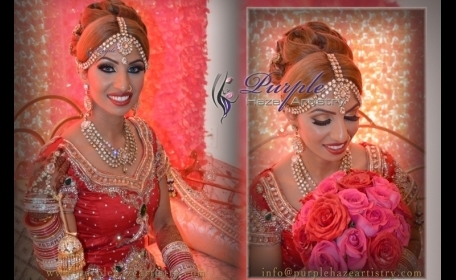 I received so many compliments from everyone…I looked and felt like a princess on both days! 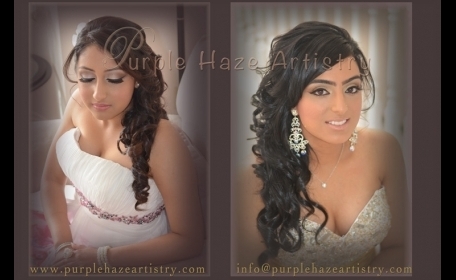 I would highly recommend Purple Haze Artistry to all the future brides because these girls are professional, excellent at what they do and create a stress free environment on your special day. Thanks ladies. Gurv, THANK YOU!! You guys did a fabulous job and so many people asked who made me beautiful - I felt like a million bucks and I received more compliments last night than on my reception AND my brother-in-laws reception, where I was an MC - THANK YOU!! I cant express it enough - cant wait to book you guys for future events! My new "go-to" artists! 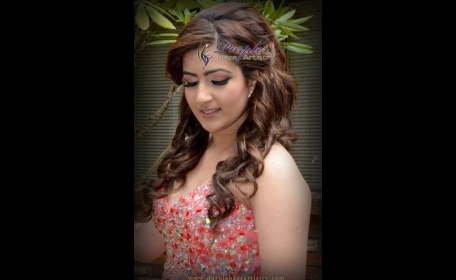 Hi Gurv, Just wanted to let you know that your artist did an amazing job on my hair and make up I recieved alot of compliments. 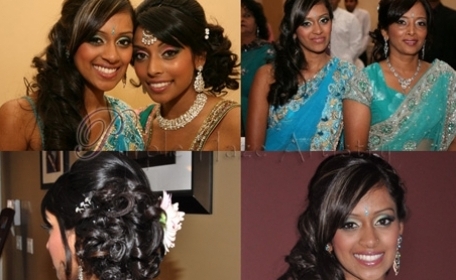 I wanted to thank you two for the amazing job that you ladies did on my hair and make up for both my wedding and reception. I have never received so many compliments! 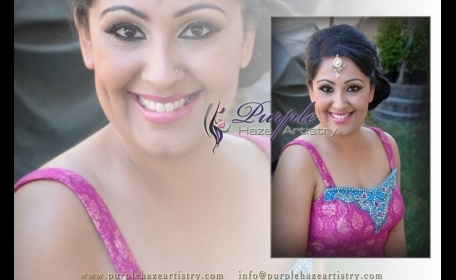 I felt absolutely amazing both days and am so glad that I... went with Purple Haze Artistry for my big day! I also wanted to say that you ladies were so easy to work with and amazingly relaxed and friendly despite the craziness during the morning of the wedding! I am looking forward to seeing the photos from the wedding and reception! I hope that I get to use your services again soon!! Ur work is just out of the world..... and its as amazing as you guys are .... thanx a lot for making us luk sooo gud.. u guys totally rock !!!! It's already been a year since that day, but when I look back at videos or pictures, I realize how much I love what you had done for me to make me look and feel like a beautiful princess on my special day! 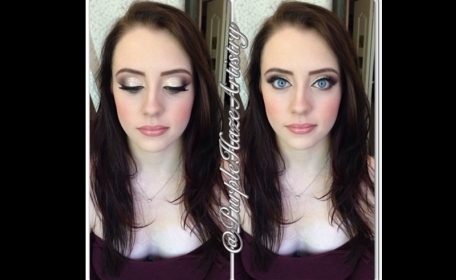 When I had met up with you for my consultation, I was apprehensive as I'm not big on makeup and didn't quite know what to expect, but they were both so fun-loving, easy to communicate ideas with, and open to suggestions. On the big day, I thought I'd know what to expect as I had already gone through the consultation, but they proved me wrong and did an AMAZING job! I thank them both for the unbelievable job they did. 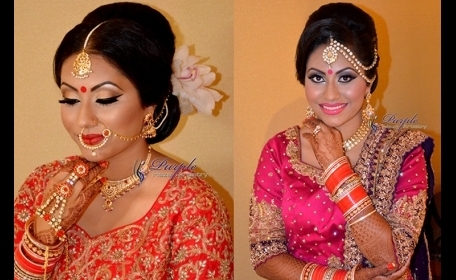 They both were very easy to get along with and have amazing personalities, and made getting ready that morning a lot of fun and stress-free :):) The end result was what I wanted and more. Thank you for being a part of my special day! I had a lot of fun with you both and hope you had the same! To add to everything else, I had kept the same hair and makeup for the evening, where we had a get together at my house and didn't need to tweak it at all. It lasted through the happiness and sadness of that day. You both are very talented and I can't thank you enough for making me feel like a princess on the most important day of my life! 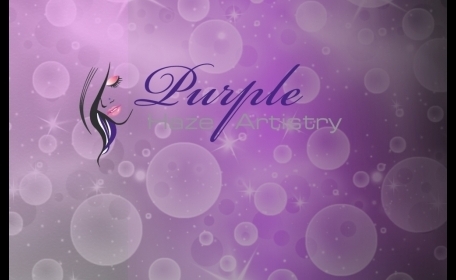 I thank you both and will definitely spread the word of Purple Haze Artistry! :):)" Hope all is well with you :):)! Thanks a ton for everything! Hope to work with you again for other family functions out there!!! Absolutely amazing work you two did on me this weekend! 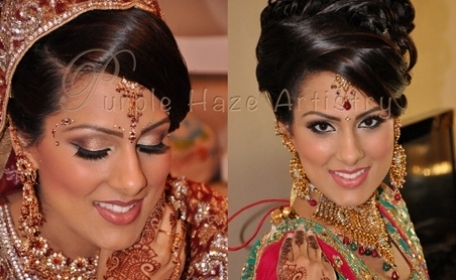 I feel like the luckiest bride ever to have had the chance to get my makeup/hair done by the both of you. You guys made my day so special. Thank you! 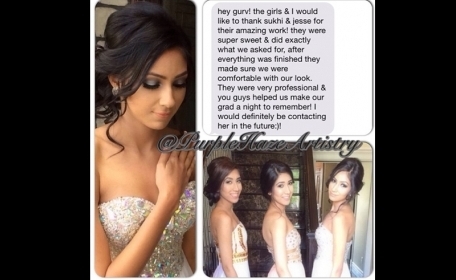 Thank you so much for such a phenomenal job on both the wedding and reception looks! 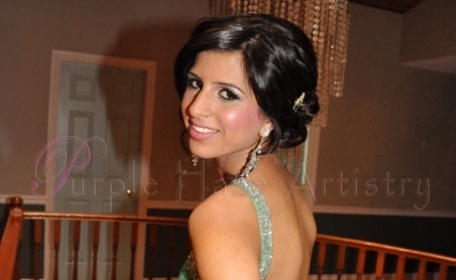 I absolutely loved my hair and make-up!! 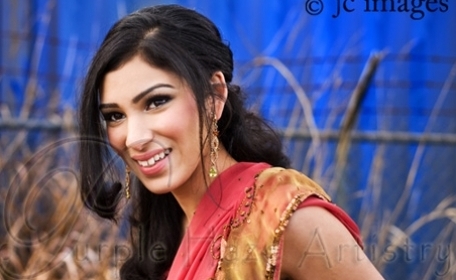 I was "INDIAN BARBIE" all weekend... and my 6 year old niece thinks I'm a "PRINCESS" . Compliments after compliments, and all the thanks goes to you both. 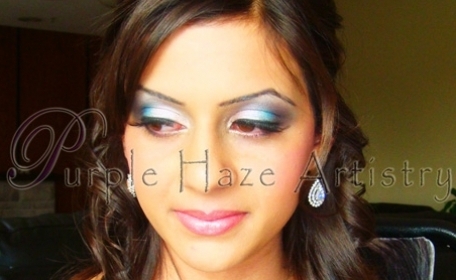 I was so confident in your work the moment we met (which would be my first make-up consultation ever! ), I knew everything would turn out amazing! It was great working with you and I'm looking forward to working with you both again in the future for other events. Thank you!! 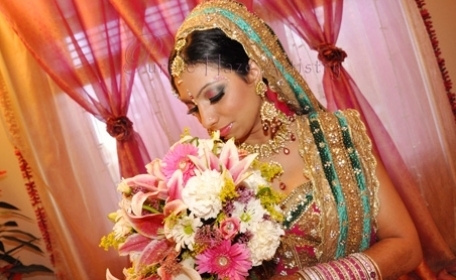 Hi Gurv, Thank you for beautifying me for my special day. Your talent is absolutely breathtaking and work is amaaaaazing. Both of you did such a beautiful job, my family & friends were just amazed by your work. I am a very simple person who doesn’t wear make up often and I was very afraid that I might end up feeling uncomfortable with either too much or wrong make up on but you did a wonder job that I had so many compliments on how beautiful I looked. Your attitude was very professional and pleasant to work with. I just wanted to thank you both for doing such an amazing job. 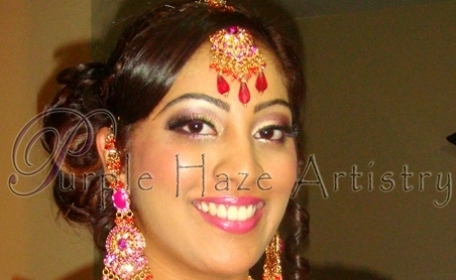 Ladies, if you are looking for a make-up & hair artist for your special day, Purple Haze Artistry is the way to go!!!! Thank you again. 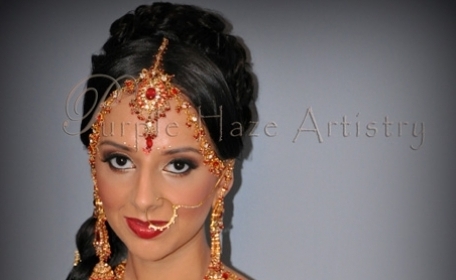 I could not have felt more like an Indian princess bride on my big day had it not been for the team from Purple Haze Artistry...WOW, what an amazing job they did. Their attention to detail, strict work ethic and the care they put into their work was outstanding. Their focus on me that day was something to be admired. Not only was I wow'd, but so was everyone else that got their first glimpse of me! I recommend them to all future brides to be. 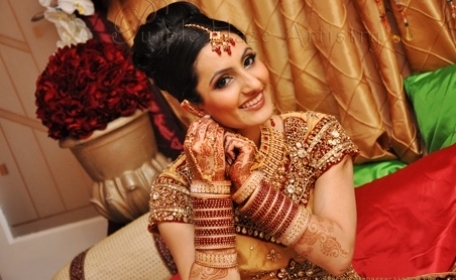 Hey Gurv, I want to thank you for the amazing job you did on my wedding day. I received so many compliments on how beautiful I looked. You really made me feel like a beautiful bride. I love your work and your professionalism. You are very talented and passionate about your work and it shows in your work. I have referred you to many people who will be coming to you in the near future. Thanks again for the wonderful job you did! 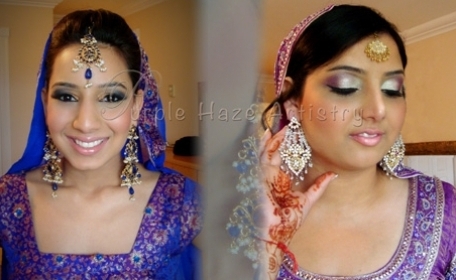 Having had many friends and family married over the past few years, I attended various make-up and hair consultations with them. 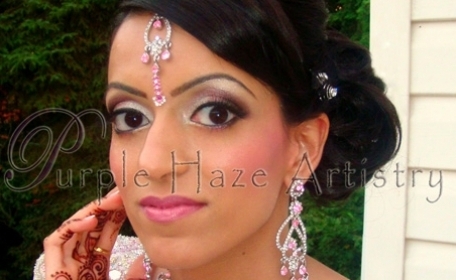 When I spotted Purple Haze Artistry's work on a close friend's sister, I knew right away they were the ones I needed to make my special day even more special. You are both extremely talented artists, who were both accommodating to my requests and offered alternative options where needed, without any hesitation. The dynamic duo even woke me up on my wedding morning as I'd slept in! 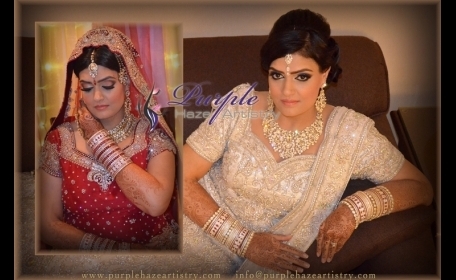 As they were a pleasure to work with, they will be number one on my list for future events. Thanks for making me look and feel like a glamorous diva! Thank you so much for doing such a wonderful job on my special day. 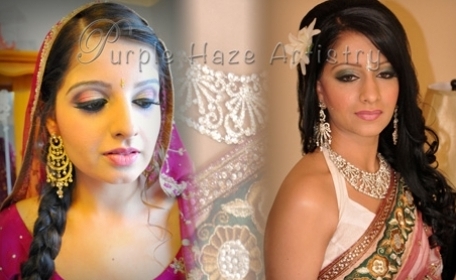 Everyone wants to look fantastic on their wedding day and thanks largely to the wonderful job Purple Haze Artistry did on my makeup and hair... I did! 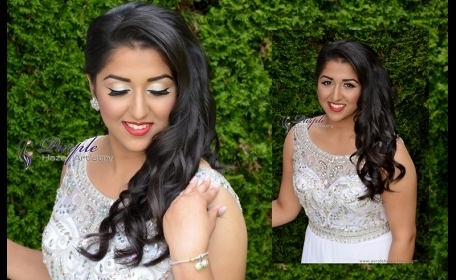 I felt very glamorous and confident with my looks. 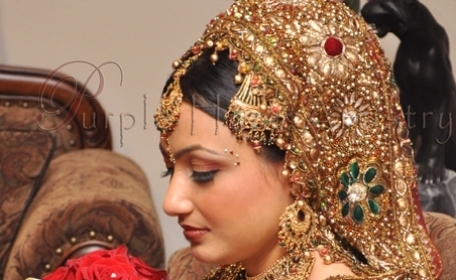 As a person who doesn’t wear much make-up, I felt that the make-up was elegant and very natural for the wedding and glamorous for the reception! I really appreciate your time and effort to travel to Bellingham for the wedding and Seattle for the reception to get me ready. It was exactly as I wanted and even though it was a very emotional day, the make-up lasted really well! 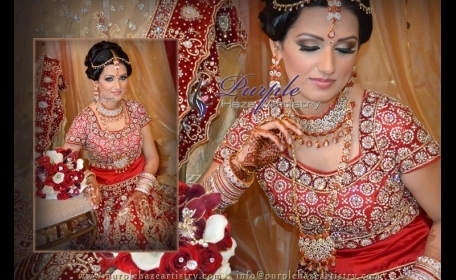 Thank you so much for your professional touch on my Wedding Day. 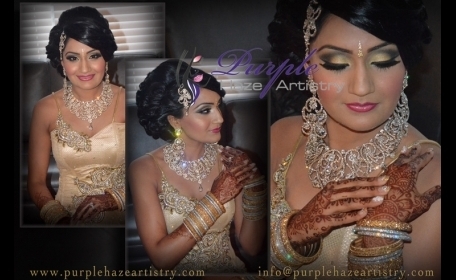 I would recommend Purple Haze Artistry to all future brides! Thanks again for helping me make my day so special. The three of us would like to say thank you to both of you for making us feel absolutely amazing. We loved how you guys took your time with us and didn't make us feel rushed. You both are so easy to talk to, and extremely talented. Once again thank you so much we will definitely be seeing you soon! 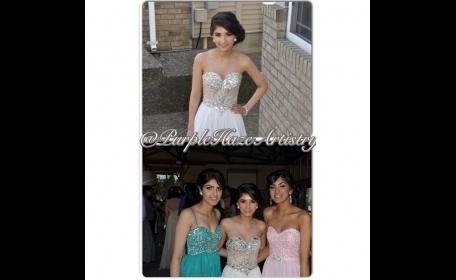 I want to thank you guys for doing my hair and makeup for my grad. you guys did a great job! I will definitely keep you in mind for future events. You are truly a talented artist. Thank you for going above and beyond my expectations, you made my day perfect. Thank you for being open to my ideas and suggestions. It was an honour to have you as my make up artist. Thanks!! Well, I can not thank you enough for the amazing job you did both for the wedding and reception. I got compliments upon compliments. I will definitely keep you in mind for future events. 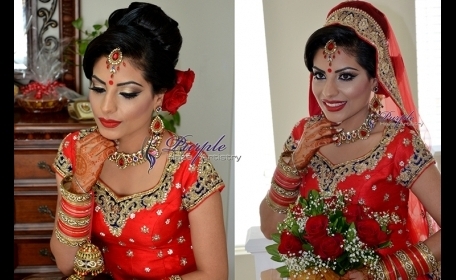 Thank you so much for doing my hair and makeup for my wedding. You did an amazing job! I was very impressed with your attention to detail and your level of professionalism. I was very happy with both my day and evening looks. You are very talented at what you do. I received so many compliments that day. I would highly recommend you to future brides. Thanks again for tonight Gurv!! I already received tons of compliments!!!! I will def be calling u in the future! 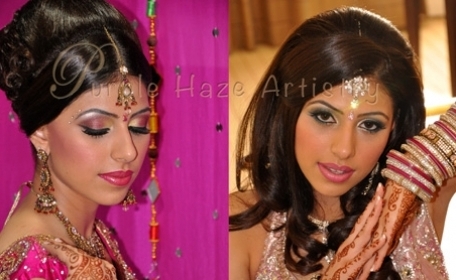 A lot of people asked me who did my hair and makeup, they were extremely impressed with your work!! 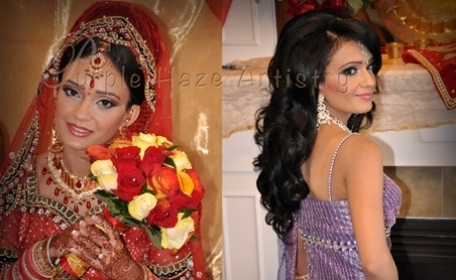 I cannot thank you two enough for all the hard work put into our hair, makeup and dressing for my Engagement Ceremony. 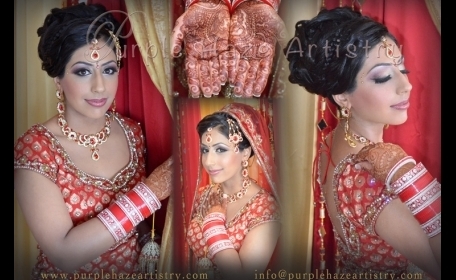 We received endless compliments and I was certainly proud to recommend your business to my family and friends. From the quality of your work to the dedication you two put into helping my mother, my sister and I look glamorous... I couldn't have asked for more. I look forward to booking with you soon in the future. Keep up the great work! 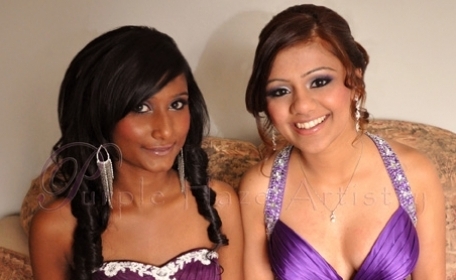 Thanks so much for doing mine and raj's makeup and hair. We got a lot of compliments, so thanks a lot for everything your work was amazing and you'll definitely be getting many calls from me. Thanks!! 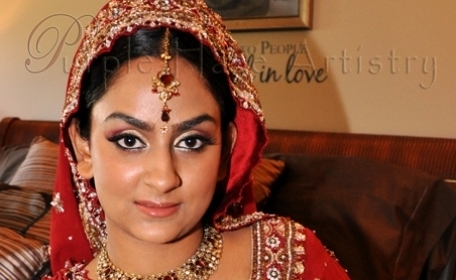 Thanks for being my make up artist for my wedding. 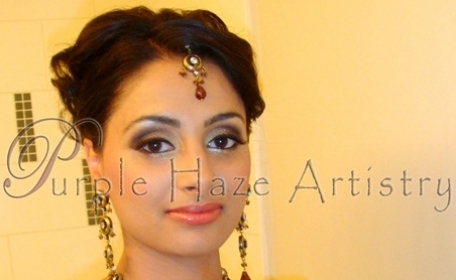 The make-up looked amazing. I was lucky to have had such a wonderful experience with you. I like to think that I was a pretty calm bride, but I have to attribute that to surrounding myself with a professional like you. Thanks!